It is a joy to have the opportunity to receive new books in exchange for my review. Only God Can Make a Kitten is one such book. This is a delightful story, with gentle rhyming and soft, whimsical illustrations. The story goes rollicking around in a conversational style, as a mother cheerfully answers the many questions of her young one. And at the end of the story, a wonderful, firm affirmation of the child’s person hood and purpose is spoken. Love that! On another note, my 15 year old is always quick to grab any book that comes into the house. After I opened the package she sat right down to look Only God Can Make a Kitten over. While she says she truly enjoyed the illustrations and the story, she absolutely did not enjoy the rhyming. We conversed about that for a bit. We have seen a number of new children’s books and many of them are written in rhyme, something that is beginning to feel overdone. Stories without rhyme would be good to see more often! Only God Can Make a Kitten is a good book to add to a family’s library. If you are interested in receiving new books in exchange for your personal opinion, check out BookLookBloggers! Now, all this talk about rhyming reminded me of maybe the best rhyme scene ever. Anyone want a peanut? Bestselling author Rhonda Gowler Greene follows a conversation between a mother and child as she explains that God made everything. 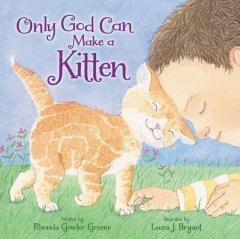 Told in delightful rhyme, this jacketed picture book shows young ones that God is behind all the beautiful blessings of creation-including kittens! Rhonda Gowler Greene is the author of over twenty picture books. Her books have received honors such as School Library Journal Best Book, Children’s Book Council Showcase Book, Bank Street College Best Book, and starred reviews. A former elementary school teacher, with a master’s in educational media, Rhonda is a frequent speaker at schools, libraries, and conferences. She lives with her husband, Gary, in a house overflowing with books in West Bloomfield, Michigan. They have four grown children. For more information, visit her on the web. If you click a link or a button, I may receive a small monetary amount from your purchase, although your purchase price will not change. The compensation is entirely from the company through which you visit from this blog.